When young Austin Philips says this out loud he can hear the plea in his voice. He can feel the emotional carnage that the next few seconds become while the standing umpire is taking his time. This is not a word in the English dictionary, it is a sound in the game of cricket. An emotion of sports so to say. But could Austin Philips always serenade to the tunes of these sounds of cricket? Young Austin is an Indian born Australian national who was detected with a hearing impairment at the tender age of two. But that did not deter him from following his dreams. Watch this video to find out how a young lad Austin Philips found his dreams of being an international cricketer realised. 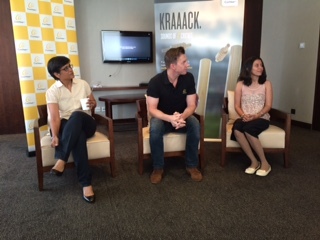 During our interaction with Brett Lee he recounted many stories from his journey so far as Global Hearing Ambassador. But the one that caught my attention was that of Austin Philips. Because the story brought a smile to Brett’s face. When I asked him to repeat the name of the boy, he excitedly repeated it a couple of times. Maybe to Brett sounds of cricket was the face of this boy who discovered his life all over again. But to me the story spoke more. I imagined an Austin walking in his class each day with a hearing aid on his ear. A smile on his face but a doubt in his heart. The one of being seen as someone not perfect. Not complete. “When we take our children for regular eye check ups then why not for hearing as well?” Roma asked this question to the panel in front. If spectacles are accepted as normal why isn’t a hearing aid? Questions that still haunt me. There is no question of one being lesser than the other here. Social stigma attached to hearing impairment is also impeding any sense of awareness that can be generated in masses today. Parents of new born infants out of sheer denial have refused basic neo-natal tests for hearing which can arrest and identify impairment at a very early stage. How can we fight this social stigma is the question I leave you with today. How do you imagine a world where a person wearing spectacles and a person wearing a hearing aid are seen in same light? All your suggestions in comments will be added to the post with due credit. So feel free and let those ideas flow here! True, when we go for regular eye check up, why not hearing as well? And the embarrassment of a hearing aid is common not just in kids but adults as well. I remember my grandfather was not ready to acknowledge that his hearing was failing an he needed a hearing aid. It took lot of convincing on our end to make him start wearing one. Like other social stigmas, the more we speak about this, the less embarrassing or less uncomfortable hearing impairment might become. Exactly, even during the meet I suggested using soft tools such as creating a superhero with learning disabilities, etc can be a great idea to seed such things. Wonderful post Richa. The perspective you have put forth really makes one ponder about all kinds of such issues that are silently growing around us. I think this is a beautiful way to get us to start talking about this and making it a part of our conversations. I feel that Social stigma is the real disability here. In so many aspects of life, it prevents us from exploring possibilities, experiencing something which one could not even imagine. I think this is a wonderful initiative by Cochlear to address this issue. Such initiatives can urge people to grow past their limiting views and discover the what lies ahead. Also, thanks to the awesome Brett Lee for supporting such a powerful movement. True Omkar, such stigmas need to be dealt with at many levels in society and treated as a disability of human race as such. Brett is obviously super awesome by being a great advocate for this message here.